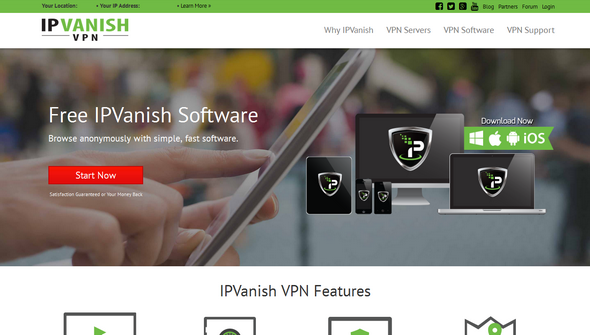 IPVanish Review – Don’t Buy Before You Read This! 2 How Does IPVanish Work? 3 What Else Should I Know? 4 What Devices Does IPVanish Support? 5 What About if I Need Help? From government censorship to corporate firewalls, hackers to ISPs, your online freedom is constantly threatened. Depending on your location you could be blocked from social media sites and your favorite music & videos. Your traffic at home can be throttled by your ISP (Internet Service Provider) your online identity known to search engines, and your Internet data vulnerable to hackers – all because you’re not using a VPN. A VPN or virtual private network is a group of computers (or discrete networks) linked together via the Internet. IPVanish is the only true tier-1 VPN service in the world. Tier-1 means it’s a network that can reach every other network on the Internet without purchasing IP transit or paying settlements. Its massive VPN network consists of more than 14,000 IPs on 140+ servers in 61 countries. Having this international presence gives IPVanish users the ability to surf anonymously and access to blocked websites from every corner of the world. 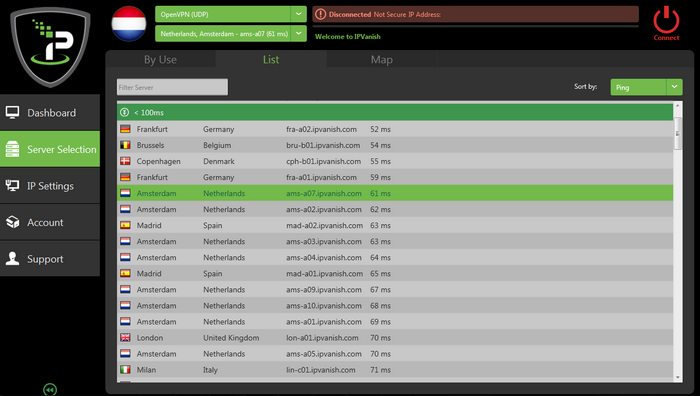 IPVanish protects your online freedom, putting you in control of your location with an anonymous IP address. It also keeps search engines from tracking your online searches by encrypting your data. Encryption keeps your online identity and data safe from the prying eyes of ISPs, cyber criminals, and anyone else who poses a threat to your Internet freedom. As a result, the IPVanish VPN creates a secure environment for everyday web use. Before you log onto the net, you will need to establish your VPN connection, which will in turn pass all of your online data (emails, instant messaging, data transfers, online banking and all online browsing) through an encrypted tunnel. This tunnel makes it so all 3rd parties – including your ISP – no longer have a view into your web browsing traffic. IPVanish backs their service with a 7-day money back guarantee on all of their subscription plans. They provide the option to sign up for a monthly, quarterly or annual subscription plan. You can save over 46% off the monthly plan rate when choosing the annual plan, and up to 26% when you subscribe to the quarterly plan. What Devices Does IPVanish Support? IPVanish can be configured on a variety of operating systems such as: Windows and Max OS X. Mobile applications are also available to download for free in the Google Play and Apple App stores. For users with a Windows compatible phone and those using routers, a manual setup guide can be found on the IPVanish site. The IPVanish software setup page has a complete list of all of the compatible devices and operating systems the service currently supports. Once there, follow the step by step tutorials to configure your connection. What About if I Need Help? IPVanish has a dedicated support center section. Live chat is also available Monday-Friday 9am-5pm EST. Users have the option to submit a ticket to support, to utilize the FAQ for answers to commonly asked questions, and may even reach out to other users and support representatives through the support forum.